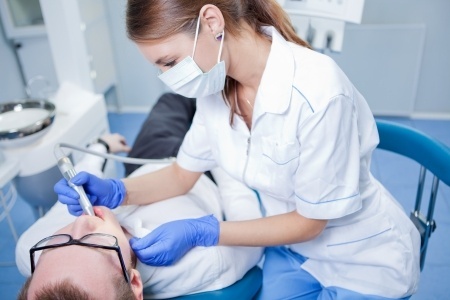 There is no denying the fact that drilling is the most uncomfortable part of any restorative procedure for patients. The high speed rotation, the sound, and at times the pain associated with the drill causes anxiety in patients even after the administration of local anesthesia, and for the longest time, there was no alternative to high speed drilling in restorative dentistry – but technology has changed that. Recently, and Air Abrasion System was introduced as an alternative to ‘drilling’ for the restoration of moderate cavities or carious lesions. Unlike conventional filling methods, whereby decay was removed with the help of a high speed rotating abrasive bur fitted on to a mechanical hand piece, the Air Abrasion system involves the ejection of a stream comprised of minute silica and aluminum oxide particles at high pressure towards the decayed portion of the teeth. The decay ‘crumbles’ upon exposure to the stream of particles ejected from the Air Abrasion hand piece, and is then suctioned out of the mouth. In this manner, the system never comes in direct contact with the tooth thus eliminating the discomfort caused by the production of heat, the sound of high speed bur rotation and the pain associated with conventional restorative procedures. The system has successfully been used at a large number of dental facilities globally, and has managed to satisfy every single patients in terms of effective treatment and a pleasant clinical experience. Air Abrasion is indicated for mild to moderate forms of dental decay and is entirely safe. It is particularly beneficial for patients that suffer from bouts of anxiety associated with dental clinics and treatments. Researchers are working towards developing and introducing more techniques that facilitate a better, more comfortable and pain-free experience for patients at dental clinics. We at Buckingham Family Dental will be more than pleased to enlighten you on similar technologies and advanced techniques that are reshaping dentistry as we know it today!